A growing number of commentators in Ireland are urging Dublin to follow London out of the EU; such a move would be beneficial because the EU has become more of a hindrance than a help to Ireland, Dr. John Anthony Coughlan told Radio Sputnik. As the UK negotiates its exit from the EU, some voices in neighboring Ireland are calling for the country to follow suit. According to economist Ray Kinsella, who wrote a widely-discussed op-ed in the Irish Times on Wednesday, the EU has become a distortion of the vision held by pioneers of European unity such as Jean Monnet and Robert Schuman. They were key figures in the formation of the European Coal and Steel Community in1951, the precursor to the European Economic Community and later the EU. "It is a hegemonistic and increasingly militarized political behemoth, controlled by Germany and, to a lesser extent, by a Franco-German identity of interests. Europe is bound together by an oppressive dependency on the center. Political scientists know that even the largest of other countries play in the reserves," Kinsella wrote. Dr. John Anthony Coughlan, Director of the National Platform for EU Research and Information Center and Associate Professor Emeritus in Social Policy at Trinity College Dublin, told Radio Sputnik that the time has come for Ireland to leave the EU, since the disadvantages now outweigh the benefits. "If we look at it objectively, there are no real advantages any longer in the Irish state staying in the EU. Ever since it joined way back in 1973, it got a large amount of money from the EU, largely because it's an agricultural producer, it got a lot of money under the Common Agricultural Policy of the EU, because Ireland is a major agricultural exporter whereas Britain imports most of its food." "Over the last three or four years, we've become net contributors, we pay more money into the EU than we get out of it. For decades, the Irish political establishment has regarded the EU as a kind of cash cow so to speak, a source of easy money." However, Coughlan said there are "some major downsides" to EU membership, such as allowing fishing boats from across the bloc to fish in Irish waters. He pointed out that Ireland's largest trading partner is the US, followed by the UK, with Belgium in third place. Consequently, Ireland should prioritize economic connections with the US and UK rather than the EU. In fact, Dublin joined the Euro single currency under the assumption that the UK would later join too, Coughlan said. "Ireland is probably the only country that could leave the Euro without causing a general crisis for the Euro currency as a whole." James Keane, a founding member of the 'People of Ireland' party, told Radio Sputnik that Ireland should follow the UK out of the EU, since living standards remain below the EU average and the country is burdened with high debt levels. 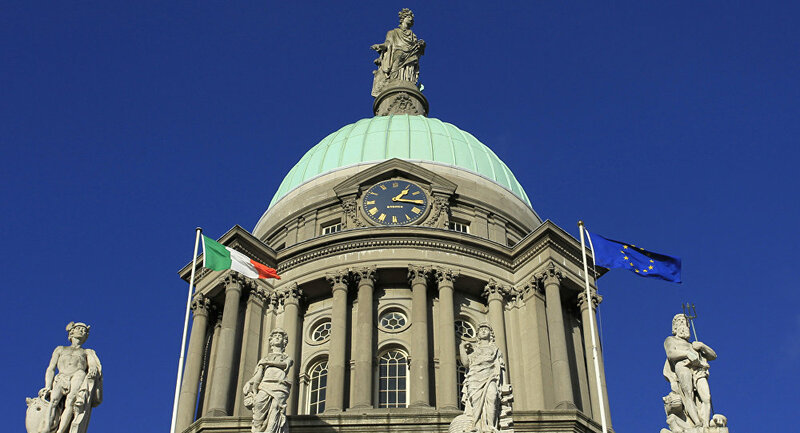 A July briefing by Ireland's National Treasury Management Agency revealed that Ireland's general government debt reached €200 billion ($237 billion), which is four times the level it was in 2007 and equates to €42,000 per person. The per capita average among the EU's 28 member states is €24,000. "The British people have made a decision to leave and I think it's a great decision, it won't be the last country to leave. Everyone is looking at how they're treating Britain now and they're getting turned off the EU because of it." "We need a critical cause regarding the European Union, we need a conversation started about it. I'm hoping my group will be able to do that, get people talking. From talking to people on the ground, door-to-door, face-to-face, I'm getting a good reaction so I can only think that that's going to grow as time goes on," Keane said.